The Environmental Protection Agency’s (EPA) air monitoring through June 10, 2010, presumably found air quality levels were “normal” on the Gulf coastline . Of course this is the same EPA whose former director, Todd Christy, boldly stated that the post 911 air was fit to breathe . Christy’s 911 comments have been removed from the EPA website but can be cross-referenced in the Guardian . The EPA’s provably wrong declaration doesn’t exactly inspire confidence in the agency’s ability to fix the current Gulf crisis. Obama’s personal point man on the spill, Thad Allen, stated “the well no longer posed any threat to the Gulf. Crews will begin the last few remaining operations needed to abandon the well this week .” Thad Allen’s statement followed Obama’s declaration in which he boldly proclaimed that the Gulf is safe and “open for business” [5, 6]. Officials from both the Food and Drug Administration (FDA) and the EPA echoed Obama’s safety claims . The interconnections between the major media and BP’s Gulf Coast partners will prevent the public from ever hearing the human side of this tragedy. Below are a few examples of what you will not see or read in the corporate controlled media. Twenty two year old PaulDoomm is paralyzed, has severe brain lesions and had to be placed in a medically induced coma to save his life. After swimming in the Gulf and eating seafood, before he was to head off to Marine Corps boot camp, he fell gravely ill. His fourteen year old brother is also now ill with a severe skin condition. Doomm’s parents are now ill and unable to work. Paul Doomm faces the real prospect of never leaving his wheel chair . As was the case with Gulf War Syndrome, the Doomm family case begs the question; can dispersant poisoning be transmitted through casual contact? Denise Rednour was working as an animal rescuer, and took photos as the oil arrived on the beach at Long Beach, Mississippi. Within a month, she suffered from blurred vision, bleeding, and lung infections. She also believed the bulk of the exposure came from inhalation of the Corexit in the air, and compared the effects to what workers in the 9/11 World Trade Centers’ bombing first responders went through . In my June 12, 2011 radio interview with Kindra Arnesen, she recounted a time when she had six children in her home and all six were experiencing symptoms ranging from sudden onset upper respiratory illness, hair falling out, chest pains and severe skin lesions . Admittedly, these three cases are anecdotal in nature, but the medical evidence clearly supports the fact that anyone who lives, or visits the Gulf, is at risk. Kim Anderson’s Oregon State University (OSU) researchers, from the OSU College of Agricultural Sciences, began a test-retest comparative analysis for the carcinogenic contaminant polycyclic aromatic hydrocarbons (PAHs), and its biodegradable partner, OPAHs, which appears after the application of corexit and subsequent exposure to ultraviolet rays. Stunningly, the OSU researchers found a 40 fold increase in these carcinogenic compounds in the comparative test-retest period . The OSU findings replicate the conclusions of Mace Barron  and the Mace Barron et al  regarding the toxicity of Corexit and its use in the Exxon Valdez oil spill. The Exxon Valdez oil spill and subsequent clean-up activities provides the only case study in the history of the United States involving significant exposure to the types of toxins discussed in this article as the result of an oil spill. Findings, related to the longevity of the Exxon Valdez clean-up workers, are very disturbing as their collective lifespan statistics revealed that the average life expectancy is a mere 51 years of age and nearly all of the Exxon Valdez clean-up workers are dead [15, 16]. These findings can leave little doubt that BP’s use of Corexit has seriously compromised the collective life span of Gulf Coast residents. Why Use the Deadly Corexit? It is mindboggling that Corexit 9500 and Corexit 9527 would be used in cleaning up the largest environmental danger in the history of the United States. According to the EPA, both forms of Corexit are the most ineffective available agents in treating oil spills and, simultaneously, both Corexit agents also pose the most toxic risk to various aquatic life forms. My fellow Republic Broadcasting Network colleague, Darren Weeks, found evidence from the EPA files that Corexit has the highest toxicity to Menindia fish of all 18 EPA tested dispersants. Just a very small amount of Corexit 9500 is required to kill 50% of fish within four days. When compared to another EPA approved dispersant, Nokomis 3-F4, Corexit 9500 is 38 timesmore poisonous to Menindia fish and 17 times more deadly to shrimp . Why not just use Nokomis3-F4? The answer is simple, Goldman Sachs, BP and Halliburton do not have any financial interests in Nokomis 3-F4. NALCO, the manufacturer of Corexit, is a subsidiary of Goldman Sachs and BP officials have financial interests in NALCO. Also, Goldman Sachs’ and Halliburton’s complicity in the oil spill figures prominently in this investigation and will be detailed in the fifth part of this series. There is additional evidence supporting Kaufman’s claims as the EPA originally ordered BP to find less-toxic chemicals to break up the Gulf of Mexico oil spill amid evidence that the ineffective dispersants could actually make the spill more harmful to life in the Gulf . However, BP showed the U.S. government who is really in charge and continued using the corexit. BP also refused to let the clean-up crews wear respirators and hazmat suits  while the EPA did nothing. Using the Exxon Valdez incident as a template, Gulf Coast residents who are continuing to be exposed to even more toxicity, can expect a life span that is 25% less than expected for adults and approximately 40-50% lower for children depending upon the age of exposure. It is reasonable to assume that within one short generation, the life expectancy of the Gulf will rival the worst of the third world. The sociopaths running the government-corporate-media-complex are simply ignoring the plight of an entire region of our country. To those who lack basic human empathy and falsely believe that this series is not news, but rather history, should consider that there is good evidence that the holocaust in the Gulf is just beginning and is now moving up the food chain and has already made its way into your local supermarket. And if you think you can dodge the obvious danger by merely avoiding the Gulf seafood, think again, as this catastrophe is permeating the full spectrum of our food supply. The threat to both the region’s and the nation’s food supply is the focus for the next installment of The Great Gulf Coast Holocaust. The United States Environmental Protection Agency.EPA Response to BP Spill in the Gulf of Mexico. http://www.epa.gov/bpspill/air.html. Retrieved July 6, 2011. The United States Environmental Protection Agency. EPA Response to September 11. http://www.epa.gov/wtc/stories/headline_091801.htm (link has been removed by the EPA). Ed Pilkington The Guardian. November 11, 2009.9/11’s delayed legacy: cancer for many of the rescue workers. http://www.guardian.co.uk/world/2009/nov/11/cancer-new-york-rescuers. Youtube. August 10, 2010. Obama: Gulf Beaches & Seafood Safe. http://www.youtube.com/watch?v=QGCpPNtY-DY&feature=related. Associated Press reported in The Washington Times Julie Pace.. Gulf “Open for Business,” Obama Says. August 10, 2010. http://www.washingtontimes.com/news/2010/aug/14/obama-declares-gulf-coast-open-business/. Louisiana Sea Food News. ‘Our Entire Motivation is Public Health,’ Says FDA Scientist. March 2, 2011. http://www.louisianaseafoodnews.com/2011/03/02/%E2%80%98our-entire-motivation-is-public-health%E2%80%99-says-fda-scientist/. Dr. Wilma Subra: Results of Independent Blood Testing of Gulf Coast Residents Shows Signs of Corexit. March 11, 2011. http://www.youtube.com/watch?v=n1e2iEmBsGo. Professor Kim Anderson through the Oregon State University Relations and Marketing: The Office of the Vice President. OSU researchers find heightened levels of known carcinogens in the Gulf. September 30, 2010. http://oregonstate.edu/ua/ncs/archives/2010/sep/osu-researchers-find-heightened-levels-known-carcinogens-gulf. Tim King. Salem-News. June 30, 2010. Almost All of the Exxon Valdez Oil Spill Workers are Dead http://www.salem-news.com/articles/june302010/oil-lifespans.php. Michael Snyder. Business Insider. June 10, 2010. Warning To Gulf Volunteers: Almost Every Cleanup Worker From The 1989 Exxon Valdez Disaster Is Now Dead. http://www.businessinsider.com/warning-to-gulf-cleanup-workers-almost-every-crew-member-from-the-1989-exxon-valdez-disaster-is-now-dead-2010-6. Alan Levin. USA Today. EPA tells BP to use less toxic chemicals. 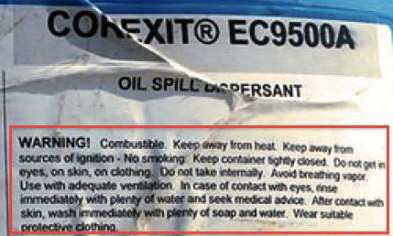 May 21, 2010. http://www.usatoday.com/news/nation/environment/2010-05-20-oil-spill-chemicals_N.htm. Once I saw the unusual burns & white stripes on my organic garden plants, I knew for sure… I carried rainwater indoors to water a few house plants & the same deformations occurred within 2 days. As for breathing the air, that’s where most of our illness came from. When they were burning off some of the surface oil, before the Corexit came into play, one could not be outdoors more than 20 minutes (30 miles from the Gulf) without feeling like passing out from the inhaled toxins… My poor animals could not come indoors with the A/C on recirc. Corexit is bad enough alone, even worse mixed with crude, but it is the oil-eating, lab-engineered bacteria, and the heavy metal soup they require to proliferate – that is causing most of the health issues in the Gulf. Add to that the fact that BP has bought up most university professors (except Univ. of South Alabama’s marine biology division, who REFUSED to sell out)… BP has paid off most physicians to diagnose “flu” or “bronchitis,” while refusing to draw blood samples for testing. When confronted directly as to WHY she refused to take blood samples for testing, MY doctor simply wrote out a prescription for antidepressants & gave me a referral for a psychological consult. INCREDIBLE! As well as not eating the seafood, we were also taking antioxidants, vitamin support, chelating agents, nascent iodine, magnesium oil, and using baths with magnesium salts, sodium bicarb, and bentonite clay, to aid our bodies in expelling the toxins… We chose NOT to be cattle, but had to survive until we were liquid enough to flee. We purchased a reverse osmosis water filter. It became ILLEGAL to take air or water samples in the area. Perhaps another reason Gulf residents have not fled the region – DISBELIEF. They are stunned, in that they cannot believe anyone could be so completely EVIL. They are also sheep & pastors in their churches have been to “training seminars” to keep their flocks calm while the depopulation is underway. Already, miscarriages in the Gulf are at 40% of pregnancies. Cancers will skyrocket over the next decade. Those responsible will never be brought to justice because the Dept. of Justice HAS BEEN BOUGHT. The Coast Guard has been BOUGHT. I’m very pleased to see the mention of Goldmann Sachs, et. al. in regards to Nalco, manufacturer of Corexit… Nalco’s Board of Directors boasts 2 members of BP’s organization as chairmen… Who is BP’s biggest client? The US Military, of course. Nothing will be done to rein in this genocide. What do you think they INTEND for those 10 million plastic coffins stored just South of Atlanta by FEMA? Which is why we left. We have been called “unpatriotic” for leaving the US. But I’d rather be alive & “unpatriotic” than another dead patriot. Go ahead… Play “Follow the Money.” David Rockefeller is the owner of General Electric & Westinghouse, who built the reactors for the Fukushima plants… There are twins in many US towns… Read up on the Rockefeller’s long history of eugenics work. Me? I’ll be down here by the sea with a glass of great wine, a wonderful view, very small population, excellent unprocessed food, including meats that never see hormones, antibiotics, or CORN, and free-range eggs. It’s too late for the US now. The only answer would be to pull down the entire system – including ALL congressmen, DOD, Pentagon, DOE, all of the “departments” and get back to a system of Natural Law, as defined by Mises at mises.org. Don’t forget to wear your tinfoil hat – all your personal accessories are spying on you, too!